NOTICE IS HEREBY GIVEN that the estimated and tentative budget for The Village of Spencer for the fiscal year 2019 – 2020 has been completed by the Board of Trustees and a copy thereof has been filed in the office of the Village Clerk, 41 Main Street, Spencer, NY, Tioga County, where the same will remain open for inspection until 6:30 PM on May 1st, 2019, when a Public Hearing will be held at the Village Office to consider such budget before Final adoption. Spencer Fire Department will hold a Open House for the Public on April 27th, between 10:00 AM to 2:00 PM. Come check out the station, the trucks and meet our firemen! Spencer Chamber of Commerce will be scheduling Spencer Yard Sale Days for the 2nd weekend of June 2019. More information will be added as June approaches. Spencer Picnic is in need of someone to run the food booth. DEC has issued a Burn Ban affective as of March 16 thru May 14, 2019. 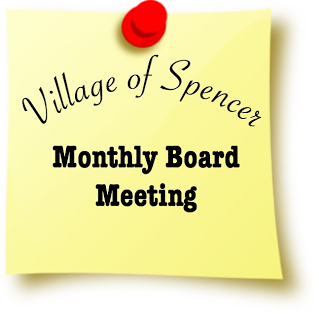 The Village of Spencer Board Meeting will be held Wednesday, May 1, 2019 at 6:30 PM for a Budget Hearing and 7:00 PM will follow a regular monthly meeting in the Municipal Room at 41 Main Street, Spencer, NY 14883. This website is Copyright © [the-year] the Village of Spencer. All rights reserved.